Leading Manufacturer of photo cell charcteristic apparatus from Ambala. Objective: To plot Forward & reverse Charcteristics of a Selenium Photo Cell verify Inverse Square Law of Light. Features: selenium Photo Cell mounted in meal box having window for injecting light, light source with 60W lamp, Photocell kit with DC micro ammeter of 1000mA & DC Millivoltmeter of 500mV. 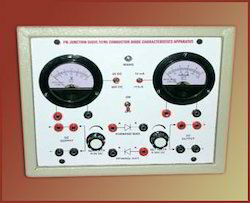 Looking for Electronics Lab Instruments ?